Middle School Math Moments (and more! ): Footloose and "FACEing Math"
We've been working on mean, median, mode, and range. I made a new Footloose game to review these concepts tomorrow. I feel like I'm stuck on these Footloose games and have trouble thinking of other review activities! But they work well and the kids like them. Tomorrow, we're going to mix it up a little, though. My instructional assistant is being observed; we decided to give the students a choice of activities, so my assistant will definitely have something to help out with, and her supervisor will be able to observe her interaction with the kids for most of the period. 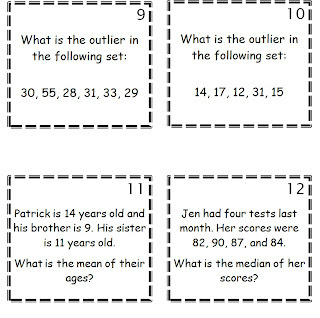 We'll give students a choice of Footloose or "FACEing Math" (by Kristin DeWittl). 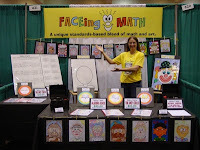 I do love the "FACEing Math" activity because it allows students who enjoy drawing the opportunity to do so in math! Also, the step-by step directions of how to add each feature/aspect of the drawing helps those of us who are NOT artists to produce a nice picture! Check out Kristin DeWitt's site! Anyway, tomorrow, students will have the choice to work on Footloose, giving them the option to be moving around if they'd like, or FACEing Math, which provides the chance to draw and color if they'd prefer. I'm curious to see the choices the students make.